The weather is warming up and that means spring and summer entertaining are not far behind. Grilling out, pool parties, and block parties are popular ways to socialize when the sun is shining. If you are looking for a summer side dish or appetizer, try this easy black bean corn salsa recipe. Black bean salsa is a great topping for grilled fish or chicken. You can also scoop it up with tortilla chips or just pile it on your plate to eat by itself! 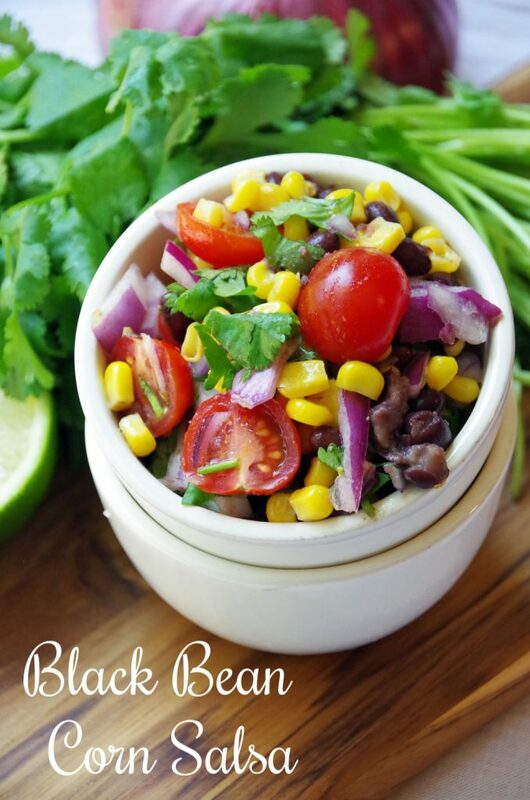 There are a lot of things to love about black bean salsa! Why should you add this to your summer recipe repertoire? Black beans are loaded with fiber and protein. I always have a can or two in the pantry. 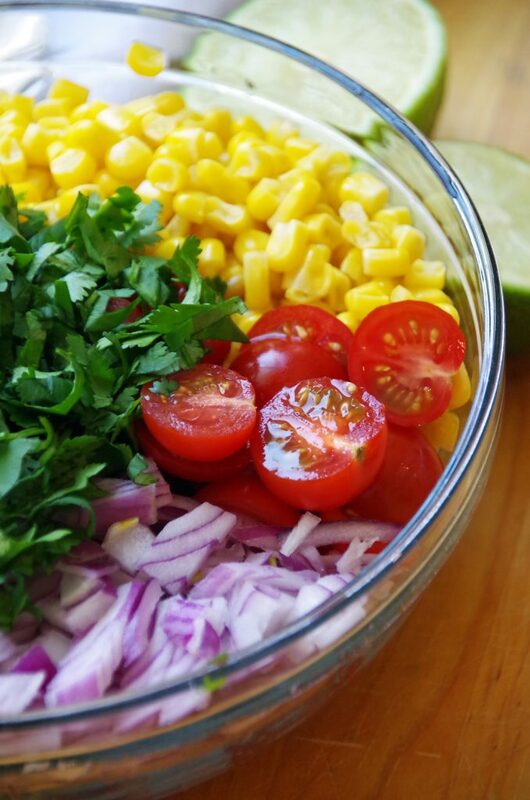 This corn salsa recipe is vegan and gluten free. It’s a great summer side dish for parties if you have guests with food sensitivities or restricted diets. You can make this homemade salsa ahead of time! Just omit the cherry tomatoes til the last minute. They get a bit wilted in the acid of the salsa. This recipe uses everyday ingredients. Nothing difficult to find here! 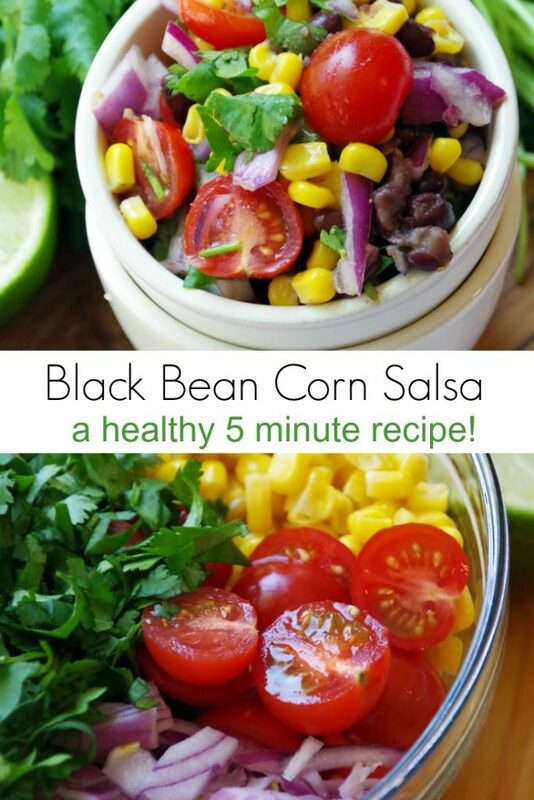 If you like this easy black bean and corn salsa recipe, you’ll love these other healthy side dishes as well. I have seen a ton of variations on this easy black bean corn salsa recipe so feel free to play with the ingredients and flavors. Want a spicy corn salsa recipe? Dice up a jalapeno and add it to the mix. Don’t like cilantro or lime? Try making black bean salsa with Italian dressing instead. You can also make this black bean corn salsa with avocados but those you should add at the last minute so they stay fresh. Once you have your favorite combination, add it on top of a baked potato, green salad, or wrap it in a tortilla with leftover chicken as a meal! If you are looking for a summer side dish or appetizer, try this easy black bean corn salsa recipe. Black bean salsa is a great topping for grilled fish or chicken. You can also scoop it up with tortilla chips or just pile it on your plate to eat by itself! 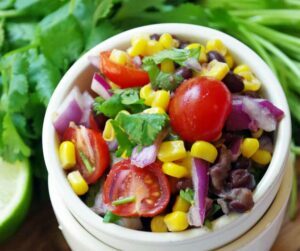 This easy black bean corn salsa recipe is a simple 5 minute Mexican recipe using canned black beans, sweet corn, red onion, and cherry tomatoes. 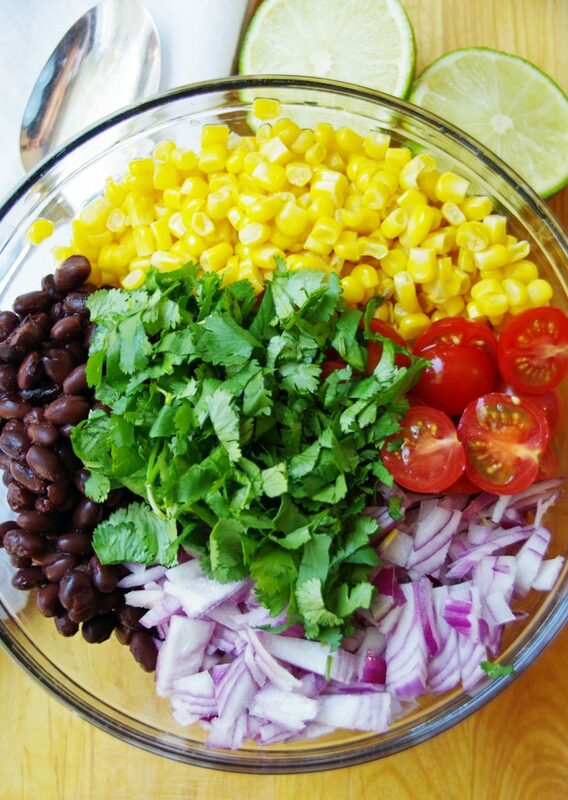 Combine the corn, beans, chopped red onion, cilantro, and cherry tomatoes in a bowl. Sprinkle with garlic powder and squeeze the lime juice over it. Stir with spoon and chill slightly before serving.